Person centred active support (PCAS) or Active Support is a proven, evidence-based approach to care and support that enables and empowers people with intellectual disabilities to participate in all aspects of life (Mansell, J. & Beadle-Brown, J., 2012). It has also been proven that active support is key to the provision of high quality of services and enhanced quality of life for people with intellectual disability. The active support approach encourages supporters and workers to customise their support to the individual to ensure they are meeting all of the person’s needs. The model uses four basic principles, 1) Every moment has potential, 2) maximise choice and control, provide assistance 3) little and often with 4) graded assistance. A practice leader is a front-line manager that have a key role in the implementation of person-centred active support and the high quality of support provided by disability support workers. The practice leader role encompasses training of a staff team to understand the needs of the people they work with, ensure the principles of active support are being adopted by the support team and demonstrate effective support through modelling and examples. Effective practice leaders encourage staff to deliver high quality support, provide detailed and consistent feedback, providing opportunities to improve through team discussions and support staff with developing their skills in high quality support. Person-centred active support and practice leadership are proven methods to improve the quality of life of people with intellectual disability to engage in everyday life and encourage the development of social relationships. Despite the evidence, embedding person-centred active support within organisations and services has proven to be difficult. The ongoing research being conducted by the Living with Disability Research Centre and its partners is integral to the continual improvement of support provided to people with intellectual disability and their quality of life outcomes. 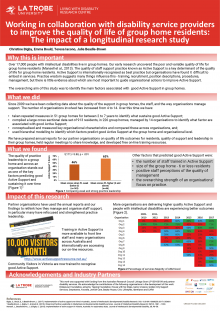 Does organisational culture matter in group homes? Research has shown that there is variability in quality of life outcomes for people with intellectual disabilities who live in group homes. Organisational culture has been identified as a factor that influences the quality of staff support and quality of life outcomes. A better understanding of organisational culture in group homes could contribute to developing strategies that enhance service delivery and, in turn, quality of life outcomes. 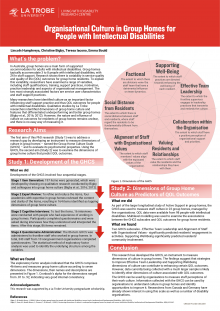 The first aim of the study was to develop a quantitative measure of organisational culture in group homes, named the Group Home Culture Scale. Its development followed a theory driven approach based on qualitative research conducted by Bigby and colleagues into group home culture. The Group Home Culture Scale is a self-report questionnaire, which was designed to be completed by disability support workers and frontline supervisors. Using data collected with the Group Home Culture Scale, another aim of the study was to examine the associations between organisational culture and quality of life outcomes for people with intellectual disabilities. The findings suggest that dimensions of group home culture are predictors of certain quality of life outcomes. Optimising outcomes for people with intellectual disabilities in supported living arrangements. Block funded, shared supported accommodation - group homes - have been the dominant service model in Australia since the 1970s. Recently, with dissatisfaction with the group home model increasing the growth of ‘supported living’ has emerged. This model separates provision of housing and direct support and has the potential to deliver more individually tailored community living support. However, little evidence exists about outcomes of supported living or the support arrangements that make it successful. The study aimed to develop knowledge about the type of support arrangements and contexts that optimise the success of supported living arrangements and quality of life for service users with intellectual disability. Mixed methods were used in three distinct sequential phrases: 1) focus groups with people with intellectual disability living in supported living 2) a face-to-face survey of service users and 3) in-depth case studies with participants selected from the survey respondents exploring further factors associated with both good and poor quality of life outcomes. Increased knowledge about the contributing factors to good quality of life outcomes for people who live in supported living arrangements will be important to the National Disability Insurance Agency in making individualised funding decisions, to the disability sector in developing services and necessary practice skills, and to people with intellectual disability and their families in making choices about housing and support options. Bigby, C., Bould, E., & Beadle-Brown, J. (2015). ‘Not as connected with people as they want to be’: Optimising outcomes for people with intellectual disability in supported living arrangements. Living with Disability Research Centre, La Trobe University. Paperwork forms a large part of group home service delivery because it is an important organisational tool that helps transform service objectives into action. Frontline staffs’ paperwork practices impact on service quality, and yet little is known about their experiences of paperwork. Having a better understanding of these experiences could reveal particular paper tools or tool characteristics that help staff provide good support to residents, and could potentially identify how staff manage and use the paper tools available in their work. The aim of this study is to explore frontline staffs’ experiences of paperwork in group homes for people with intellectual disabilities. What is it like to work as a frontline staff member in a group home? How do frontline staff think about paperwork? How do staff use paperwork? This study will generate new understanding of how staff reflect on and use paper tools in their workplace. The results will inform disability service organisations on how to best support frontline staff with paper tools so that staff are equipped to support residents to live good lives. Quilliam, C., Bigby, C., & Douglas, J. (2018). How frontline staff manage paperwork in group homes for people with intellectual disability: Implications for practice. Journal of Applied Research in Intellectual Disabilities. Quilliam, C., Bigby, C., Douglas, J. (2018). Being a valuable contributor on the frontline: The self-perception of staff in group homes for people with intellectual disability. Journal of Applied Research in Intellectual Disability; 00:1–10. Quilliam, C., Bigby, C., & Douglas, J. (2018). Staff perspectives on paperwork in group homes for people with intellectual disability. Journal of Intellectual and Developmental Disability, 43(3) 1-10. Quilliam, C., Bigby, C., & Douglas, J. (November, 2015). An evil necessity: Frontline staffs’ experiences of group home paperwork. Paper presented at the 50th Annual Australasian Society for Intellectual Disability Conference, Melbourne. Quilliam, C., Bigby, C., & Douglas, J. (November, 2014). A frontline perspective of paperwork in group homes for people with intellectual disability: Preliminary findings. Paper presented at the 49th Annual Australasian Society for Intellectual Disability Conference, Fremantle. Improving outcomes for adults with intellectual disabilities living in supported accommodation remains a significant issue for research and practice both in the UK and further afield. The reality is that many people with intellectual disabilities, especially those with more severe disabilities, still lead lived marked by disengagement, isolation and lack of control. Research has shown that the two most powerful factors in determining outcomes appear to be the level of ability of the individuals themselves and whether staff are using an enabling and empowering approach to support (ie active support). Despite being recognised as an important factor in the realisation of good outcomes there is little empirical research exploring culture in supported accommodation and particularly not culture associated with good client outcomes and staff practices. This study builds on earlier work on quality of supported accommodation for people with intellectual and developmental disabilities and is linked with current research in Australia. This study uses an embedded multiple case-study research design to investigate the culture in three supported accommodation settings which have been identified as providing skilled support and achieving good outcomes. ‘Culture’ refers to the pattern of shared basic assumptions held by the staff group, developed as the group solved problems it encountered and then taught to new members as the correct way to think and operate within that setting (Schein, 1992). Long -term participant observation will be the primary method used to uncover the culture in these settings, supplemented by interviews and documentary analysis. The aim of the analysis is to provide an explanation of the processes and outcomes in each of the three settings, followed by a cross-case synthesis using comparable Australian data to develop the evidence base and to support the development of tools to support the development of positive helpful cultures in social and health care services. Richardson, L., Beadle-Brown, J., Bigby, C., & Bradshaw, J. (2016). understanding the culture of supported accommodation for individuals with severe/profound intellectual disabilities: Preliminary findings from ‘good’services. Journal of Intellectual Disability Research, 60(7), 727. The Guide to Visiting and Good Group Homes is a resource based on research evidence to describe what a good group home for people with more severe levels of intellectual disability looks like, what you should expect to see and hear if residents are experiencing a good quality of life. Written in collaboration with The Office of the Public Advocate (Victoria), this guide was based on research and written for Community Visitors who visit and report of the quality of life of people living in supported and group accommodation. Bigby, C., & Bould, E. (2014). Guide to Visiting and Good Group Homes. Melbourne: Living with Disability Research Group, La Trobe University. Centre for Applied Disability Research; A Guide to Good Group Homes (Action guide). Although the quality of life outcome for residents with intellectual disability in supported accommodation compares very favourably to cluster type housing or traditional institutions, it does not consistently deliver high quality support. Good staff support is linked to good outcomes for residents in supported accommodation. Some residents have very low levels of engagement in meaningful activity and relationships, and outcomes can vary enormously both within and between services. Although many disability services in Australia have embraced Active Support, it has proved difficult to implement (Mansell & Beadle-Brown, 2012). The aim of this study is to identify the organisational structures and processes associated with the successful and sustained delivery of Active Support. The longitudinal study to be completed over 5 years, aims to improve front-line staff practices and the delivery of Active Support, and thus the quality of life of people with intellectual disability. See Active support resources for more information. Annecto Inc, Endeavour Foundation, Karingal, Sunshine, Golden City Support Services, Greystanes, Yooralla, Jewish Care CARA (SA), E.W. Tipping, Bayley House, House with No Steps (QLD) and Civic Lifestyles (NSW). Bould, E., Beadle-Brown, J., & Bigby, C. (2018). Measuring practice leadership in supported accommodation services for people with intellectual disability: Comparing staff-rated and observational measures. Journal of Intellectual and Developmental Disability, 43(2). Beadle-Brown, J., Radwanski, A. (2015). Person-centred active support – the cake not the icing. In Handbook on Intellectual Disability and Clinical Psychology (second edition) Edited by Linehan, C., Noonan-Walsh, P., McEvoy, J., O'Reilly, G. and Carr, A.
Bigby, C., Beadle-Brown, J., & Bould, E. (2014, November). The nature, extent and role of practice leadership for staff teams supporting people with intellectual disability. Paper presented at the 2014 annual conference of the Australasian Association for Intellectual Disability, Fremantle, Australia [Abstract published in Journal of Applied Research in Intellectual Disabilities. 27(4), 352]. Iacono, T., Bould, E., Beadle‐Brown, J., & Bigby, C. (2019). An exploration of communication within active support for adults with high and low support needs. Journal of Applied Research in Intellectual Disabilities, 32(1), 61-70. Iacono, T., Bigby, C., Bould, E., & Beadle-Brown, J. (2014, July). The Relationship between Communication and Quality of Person Centred Active Support. Paper presented at the International Association for the Scientific Study of Intellectual & Developmental Disabilities. Vienna, Austria [Abstract published in Journal of Applied Research in Intellectual Disabilities, 27(4), 351]. Every moment has potential is an online learning resource that provides an introduction to Person Centred Active Support - a way of working that enables everyone, no matter what their level of intellectual or physical disability, to make choices and participate in meaningful activities and social relationships. Funders: Department of Industry, Greystanes Disability Services, Living with Disability Research Group at La Trobe University. The project produced a Service Effectiveness Framework to tailor organisational effectiveness indicators to measure and monitor the performance of disability service providers in providing support that makes a difference in people's lives. Funders and external reviewers: to review and critique the service delivery outcomes of providers consistent with regulations, standards or other accountability requirements. 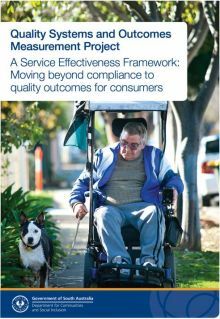 How is service quality understood and measured in disability services? The aim of this research is to explore the question ‘How is service quality understood and measured in disability services?’ In doing so, it is hoped that this research will highlight the current and future capacity of Victorian day services to identify the quality of the support they provide by measuring how people with disabilities, in both a positive and negative context, experience services. The impetus for this research stems from the fact that despite the Victorian disability sector measuring service quality since the 1990s, research suggests that service users experience low levels of engagement with others, have restricted opportunities for decision making and choice, limited opportunities to form social relationships and often experience boredom and bullying (Clegg & Bigby, 2017). One of the reasons for this could be that current regulatory measures imposed on funded Victorian day services focus on administrative processes, with little attention played to service users experience of support. However, whilst Victorian day services must comply with state regulations, they can also invest in their own quality measures, should they choose to. Several quality models that aim to measure the outcomes of service provision for people with disabilities are available to day services. Whether or not services choose to adopt such measures and why remains unknown, largely because little research has been conducted on these issues.